Studying to become a doctor is not an easy thing! The level of information is high and the quantity is pretty scary if you don’t know what to expect. However, if you want a license to practice medicine in the US, you will need the take the USMLE Step 1 (also known as The Boards). While studying for the Step 1 examination may seem quite an unbearable task, there are a few steps you can follow to make sure you’ll score the best possible points. First, you have to set your studying goals realistically. For this, you need to start studying early so you’ll have the time to go through all the materials. The second step (and just as important as the first) is choosing the right resources. Many students tend to hoard books that will require Herculean strength just to move from one side of the room to the other. And they don’t stop here! They also gather DVDs, notes, and Qbanks. The secret here is to choose only the best resources and throw away the rest. 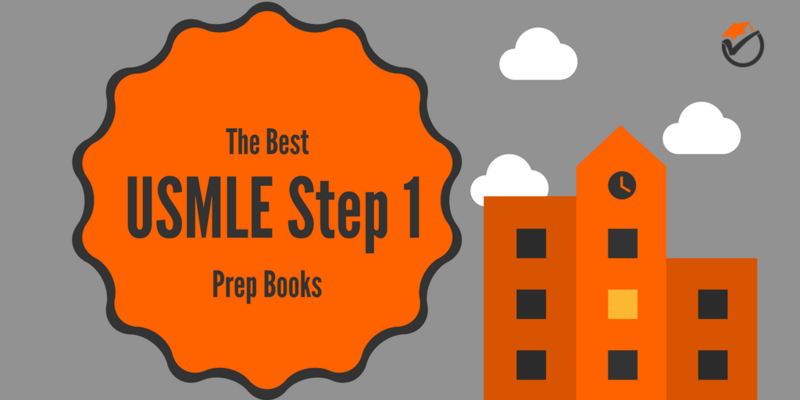 So, to make sure you will pass your USMLE Step 1 test with a satisfying result, we put together a list of the top 5 best USMLE Step 1 Prep books to have. You can choose one or you can choose all of them, the choice is yours! With a history of over 40 years of helping students prepare for their medical licensing exam, Kaplan Medical knows what you need to succeed at your test. The information you can find in the Kaplan USMLE Step 1 Lecture Notes were gathered, sorted, and filtered by expert advisors in order to offer the correct level of support for students everywhere. The notes are delivered as a 7-volume set (2786 pages) containing information on Pathology, Pharmacology, Physiology, Biochemistry, Medical Genetics, Immunology and Microbiology, Anatomy, and Behavioral Science/Social Sciences. These books represent a valuable resource for lots of people preparing to pass the examination because they offer complete information on all necessary topics. Even more, the content is well-organized, with summary boxes that help you learn easily. Also, there are plenty of connections between disciplines so you’ll know when a correlation shows up. Very principle is reviewed in depth and nothing is left out. Thousands of students use these books every year because they don’t just describe the principles and other information. The act of learning is not boring and difficult but explained in high details so anyone can understand. Also, many such resources tend to use an academic language which can be dense and difficult to memorize and understand. This is not the case with Kaplan USMLE Step 1 Lecture Notes! The information is well-structured and the text is written with an eye for accessibility and accuracy. The few complaints these books got make reference to the type of paper used for printed copies. While it’s a bit thin, it’s nothing you couldn’t handle in our opinion. Also, many readers expressed their desire to see these books combined with videos for 100% efficiency. Also known as the Bible for USMLE Step 1 preparation, this 784 page book is the second best resource in your arsenal. The information is updated annually and each version is co-authored by medical students who just went through the examination. This way, the ones coming after them, get fresh insight into how to learn and what to learn for the test. 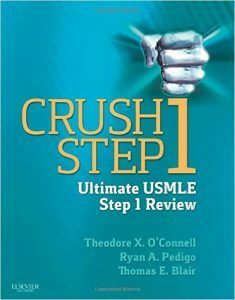 Besides extremely well-organized information with colorful images and a logically structured format, the First Aid for USMLE Step 1 also provides students with a wide range of tricks, high-yielding facts, and mnemonics that help in the learning process. It also teaches you how to cope with the stress of the exam which is extremely important. 2) 1000+ images, photos, and diagrams which are great for visualizing the content and putting everything in a graphical form. This is extremely effective with concepts that are difficult to understand. All in all, this is a complete resource that gets yearly updates on the needed information. On the downside, there are copies where the ink smudges easily so it is recommended to be careful when studying. 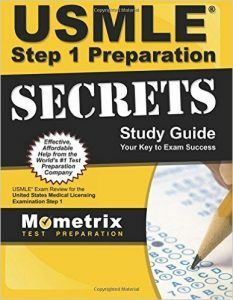 The Preparation Secrets Study Guide should also be in your top 5 resources due to the level of explanations it offers. You’ll have full access to the top 20 tips to master the USMLE Step 1 test and you’ll learn about the procedures, concepts and principles you should know in order to pass the exam successfully. For example, the guide covers the basic principles of genetics, pharmacology, micro, behavioral science, immunology and more. Even more, this handy guide of 430 pages is going to let you in on the type of vocabulary that is expected from you by the FSMB (the Federation of State Medical Boards). However, you shouldn’t worry about getting lost in academic language – everything is explained clearly and thoroughly. Another feature that makes this book so great is the way authors address difficult concepts and principles. They don’t just go by them; they took the effort of describing everything in detail. Finally, the guide also talks about how to get prepared from a physical and mental (emotional) point of view. This is one aspect that most USMLE Step 1 prep books seem to forget. Even though the structure could have been better (no diagrams, images, or tables) the book is extremely useful for reviewing purposes. However, you should keep in mind that, if you want to find a certain topic, you’ll have to look for it. You can’t just browse it as all the pages look basically the same. According to the authors, if you learn all the concepts and tips in this 680-pages book you shouldn’t just pass the exam, you should crush it! Well, they are quite right if we consider the fact that this resource covers all the materials required for the USMLE Step 1 examination. The content is up-to-date and easy to read and the text structure is well-designed. To help students learn faster and better, the structure is divided into key sections, followed by practice questions and rapid-review boxes that lead to great results. The great structure makes the information to be easily accessible and the multitude of lists and tables highlights the most important areas. This way you won’t have to lose time with searching for information that’s easy to find. We consider the Crush Step 1 guide as being one of the best and most effective on the market. The fact that it doesn’t just offer the necessary materials, but it also helps you put together a prep strategy shows that authors have students’ best interest in mind. Unlike other resources where the focus is set on memorizing the materials, the Crush Step 1 guide focuses mostly on identifying and understanding question stems. This way it will be a lot easier to remember when you are under examination. By the end of the book, you’ll run through over 100 practice questions, which is a fantastic way to review and remember information. 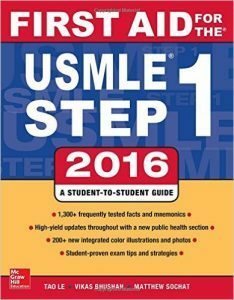 This 416-pages USMLE Step 1 prep guide is the best resource to choose when you are on a budget. It’s not the perfect resource as it doesn’t contain all the necessary concepts, but it’s a fantastic start. It’s actually an outline of the basic information in Pathology, Microbiology, Pharmacology, Biochemistry, Anatomy, Physiology, and Social Science, and everything is presented as a chart. The author is one of the few people who managed to score in top 3% of the USMLE Step 1 test so you should think about this before dismissing the guide. While it is not complete or bushy the book tries to summarize the basic material in a format that’s easy to understand and visualize. So, you can use it as a resource for beginners or you can use it as a resource to review and refresh the concepts you’ve learned – it works both ways just as effective. Even more, you’ll get an additional Internet reference to a quiz with over 1000 questions organized in a time-saving and interactive style. In the end, the USMLE Step 1 Made Ridiculously Simple guide wants to show students that learning can be fun and there’s no need to stress about it more than you already have. At the end of the day you are the one who will choose the resources for your exam prep. However, the books and guides we mentioned above are very popular among students and they proved their effectiveness countless times. While some may be a bit expensive, they are all worth your attention. 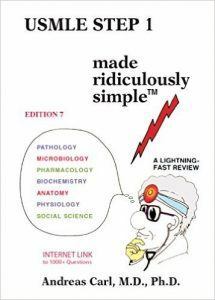 Start with the Kaplan USMLE Step 1 Lecture Notes and go down the list until you reach the USMLE Step 1 Made Ridiculously Simple guide (amazing for reviews) and you shouldn’t have any problems passing the test with great results. Even more, each of these guides represents a great resource on their own so, if you’re just looking for something to help you review your knowledge, the last on our list will work great. 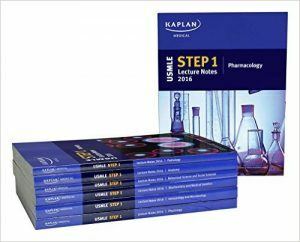 On the other hand, if you’re looking for the best guide with all the necessary information, we recommend the Kaplan USMLE Step 1 Lecture Notes – this is the most complete resource on our list.